A lot of my work lately has involved assessing web services; some are relatively straightforward REST and SOAP type services, but some of the most interesting and challenging involve varying degrees of additional requirements on top of a vanilla protocol, or entirely proprietary text-based protocols on top of HTTP. Almost without fail, the services require some extra twist in order to interact with them; specially crafted headers, message signing (such as HMAC or AES), message IDs or timestamps, or custom nonces with each request. These kind of unusual, one-off requirements can really take a chunk out of assessment time. Either the assessor spends a lot of time manually crafting or tampering with requests using existing tools, or spends a lot of time implementing and debugging code to talk to the service, then largely throws it away after the assessment. Neither is very good use of time. Ideally, we’d like to write the least amount of new code in order to get our existing tools to work with the new service. This is where writing extensions to our preferred tools becomes massively helpful: a very small amount of our own code handles the unusual aspects of the service, and then we’re able to take advantage of all the nice features of the tools we’re used to as well as work almost as quickly as we would on a service that didn’t have the extra proprietary twists. Burp is the de facto standard for professional web app assessments and with the new extension API (released December 2012 in r1.5.01) a lot of complexity in creating Burp extensions went away. Before that the official API was quite limited and several different extension-building-extensions had stepped in to try to fill the gap (such as Hiccup, jython-burp-api, and Buby); each individually was useful, but collectively it all resulted in confusing and contradictory instructions to anyone getting started. Fortunately, the new extension API is good enough that developing directly against it (rather than some intermediate extension) is the way to go. The official API supports Java, Python, and Ruby equally well. Given the choice I’ll take Python any day, so these instructions will be most applicable to the parseltongues. Getting set up to use or develop extensions is reasonably straightforward (the official Burp instructions do a pretty good job), but there are a few gotchas I’ll try to point out along the way. In Burp, switch to the Extender tab, then the Options sub-tab. Now, configure the location of the jython jar. At this point the environment is configured; now it’s time to load an extension. The default one in the official Burp example does nothing (it defines just enough of the interface to load successfully), so we’ll go one step further. Since several of our assessments lately have involved adding some custom header or POST body element (usually for authentication or signing), that seems like a useful direction for a “Hello World”. Here is a simple extension that inserts data (in this case, a timestamp) as a new header field and at the end of the body (as a Gist for formatting). Save it somewhere on disk. To load it into Burp, open the Extender tab, then the Extensions sub-tab. Click “Add”, and then provide the path to where you downloaded it. Test it out! Any requests sent from Burp (including Repeater, Intruder, etc) will be modified by the extension. Output is directed to the tabs in the Extender>Extensions view. A request has been processed and modified by the extension (timestamps added to the header and body of the request). Since Burp doesn’t currently have any way to display what a response looks like after it was edited by an extension, it usually makes sense to output the results to the extension’s tab. This is a reasonable starting place for developing your own extensions. From here it should be easy to play around with modifying the requests however you like: add or remove headers, parse or modify XML or JSON in the body, etc. It’s important to remember as you’re developing custom extensions that you’re writing against a Java API. Keep the official Burp API docs handy, and be aware of when you’re manipulating objects from the Java side using Python code. Java to Python coercions in Jython are pretty sensible, but occasionally you run into something unexpected. It sometimes helps to manually take just the member data you need from complex Java objects, rather than figuring out how to pass the whole thing around other python code. To reload the code and try out changes, simply untick then re-tick the “Loaded” checkbox next to the name of the extension in the Extensions sub-tab (or CTRL-click). Between the statically-typed Java API and playing around with code in a regular interactive Python session, it’s pretty quick to get most of a custom extension hacked together. However, when something goes wrong, it can be very annoying to not be able to drop into an interactive session and manipulate the actual Burp objects that are causing your extension to bomb. 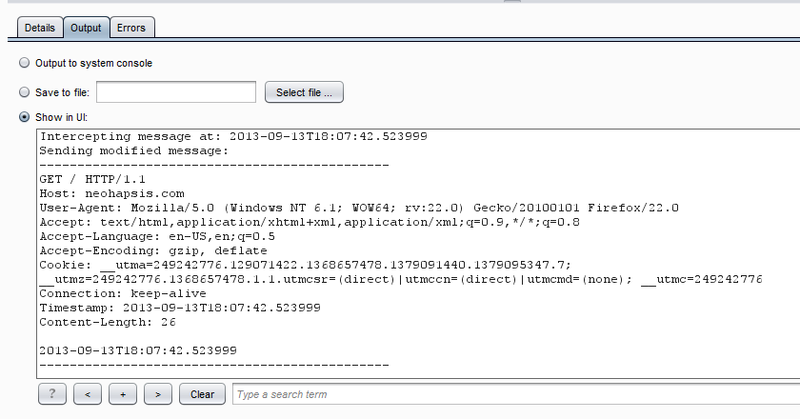 Fortunately, Marcin Wielgoszewski’s jython-burp-api includes a an interactive Jython console injected into a Burp tab. While I don’t recommend developing new extensions against the unofficial extension-hosting-extensions that were around before the official Burp API (in 1.5.01), access to the Jython tab is a pretty killer feature that stands well on its own. 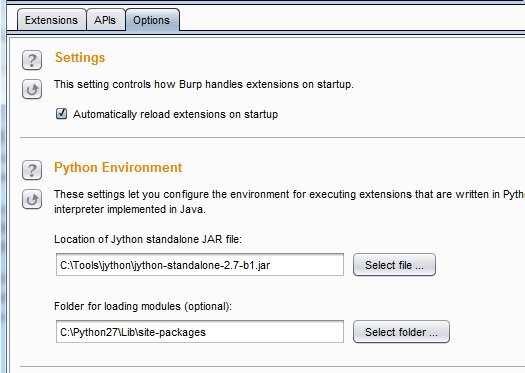 You can install the jython-burp-api just as with the demo extension in step 6 above. The extension assumes that the “Folder for loading modules” (from step 4 above) is set to its own Lib/ directory. If you get errors such as “ImportError: No module named gds“, then either temporarily change your module folder, or use the solution noted here to have the extension fix up its own path. Once that’s working, it will add an interactive Jython shell tab into the Burp interface. This shell was originally intended to work with the classes and objects defined jython-burp-api, but it’s possible to pull back the curtain and get access to the exact same Burp API that you’re developing against in standalone extensions. Within the pre-defined “Burp” object is a reference to the Callbacks object passed to every extension. From there, you can manually call any of the methods available to an extension. During development and testing of your own extensions, it can be very useful to manually try out code on a particular request (which you can access from the history via getProxyHistory() ). Once you figure out what works, then that code can go into your extension. Objects from the official Burp Java API can be identified by their lack of help() strings and the obfuscated type names, but python-style exploratory programming still works as expected: the dir() function lists available fields and methods, which correspond to the Burp Java API. When assessing custom web services, what we often get from customers is simply a spec document, maybe with a few concrete examples peppered throughout; actual working sample code, or real proxy logs are a rare luxury. In these cases, it becomes useful to have an interface that will be able to help craft and replay messages, and easily support variations of the same message (“Message A (as documented in spec)”, “Message A (actually working)”, “testing injections into field x”, “testing parameter overload of field y”, etc). While Burp is excellent at replaying and tampering with existing requests, the Burp interface doesn’t do a great job of helping to craft entirely new messages, or helping keep dozens of different variations organized and documented. For this task, I turn to a tool familiar to many developers, but rather less known among pentesters: SoapUI. SoapUI calls itself the “swiss army knife of [web service] testing”, and it does a pretty good job of living up to that. By proxying it through Burp (File>Preferences>Proxy Settings) and using Burp extensions to programmatically deal with any additional logic required for the service, you can use the strengths of both and have an excellent environment for security testing against services . SoapUI Pro even includes a variety of web-service specific payloads for security testing. 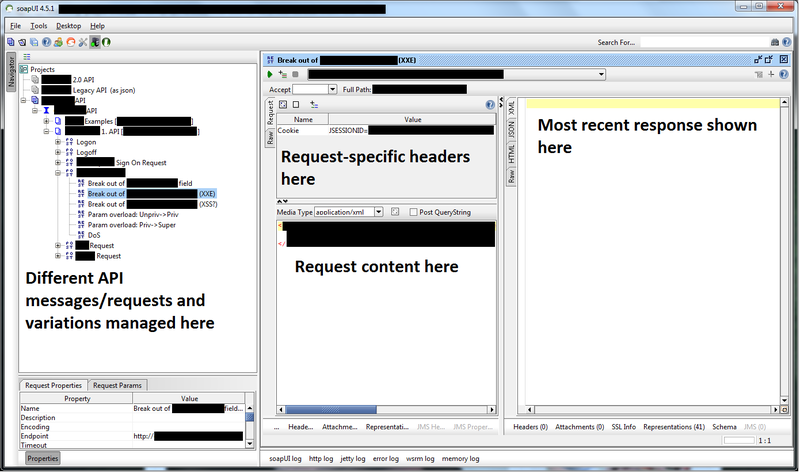 The main SoapUI interface, populated for penetration testing against a web service. Several variations of a particular service-specific POST message are shown, each demonstrating and providing easy reproducability for a discovered vulnerability. If the service offers a WSDL or WADL, configuring SoapUI to interact with it is straightforward; simply start a new project, paste in the URL of the endpoint, and hit okay. 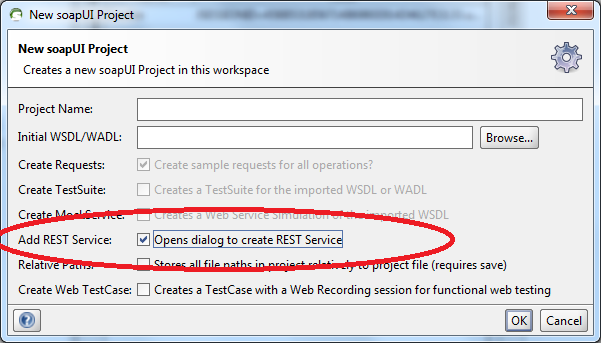 If the service is a REST service, or some other mechanism over HTTP, you can skip all of the validation checks and simply start manually creating requests by ticking the “Add REST Service” box in the “New SoapUI Project” dialog. Create, manage, and send arbitrary HTTP requests without a “proper” WSDL or service description by telling SoapUI it’s a REST service. In addition to helping you create and send requests, I find that the soapUI project file is an invaluable resource for future assessments on the same service; any other tester can pick up right where I left off (even months or years later) by loading my Burp state and my SoapUI project file. This should be enough to get you up and running with custom Burp extensions to handle unusual service logic, and SoapUI to craft and manage large numbers of example messages and payloads. For Burp, there are a tons of tools out there, including official Burp examples, burpextensions.com, and findable on github. Make sure to share other useful extensions, tools, or tricks in the comments, or hit me up to discuss: @coffeetocode or @neohapsis. This entry was posted in Application Security, Information Security, Security Testing, Security Tools, Web Applications. Bookmark the permalink. Update on this: The latest version of Burp (1.6beta) includes the Burp App Store, which makes installing plugins significantly easier. Regarding the Jython console mentioned above, you’ll want to register “jython-burp-api\Lib\burp_extender.py” as the extension file in the “Load Burp Extension” window. The “run.py” file is for a different approach where you’re actually hosting burp itself within jython-burp-api.